The countryside of the Marche region. ​The countryside of the Marche region. When people decide to visit the countryside, the inland of the Marche region, they have to expect peaceful and gently rolling hills. Scattered across all the region, there is historical and cultural heritage due to the fact that every area was controlled by its own lord. The countryside covers 69 % of the territory and it is a blend of crop fields, forestry and sheep and cattle grazing. History can also be found in ancient Roman roads, like the Via Salaria which connected Rome with the Adriatic sea or Via Flaminia which ends in Fano. In the countryside there are different small towns, or medival towns which still perform historical pageants and general or religious festivities. 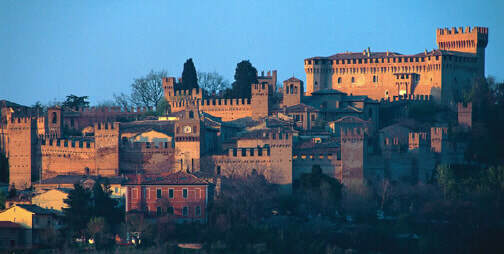 Medival towns are: Offagna, Offida, Corinaldo, Agugliano and Gradara. Many old villas, nowadays are turned into agriturismi which are farm holiday centres, providing peaceful and quiet accomodation. Almost 10% of the regional territory is subject to safeguard as form of protected areas. There are two National Parks, four Regional Parks (Sasso Simone e Simoncello, Gola della Rossa e di Frasassi, Monte San Bartolo and Monte Conero) and five nature reserves (Abbadia di Fiastra, Montagna di Torricchio, Gola del Furlo, Ripa Bianca and Sentina). Visiting the inland of the Marche region, also means discovering traditional crafts which are still practised in workshops. It includes pottery, footwear, copper, terracotta, hand-made carpets, toys, musical instruments etc.. In the region itself, people will find different culinary tradition: on the coast it will be dishes based on fish, while, in the inlands dishes are based on meat and specifically on bushmeat.